Northbrook, IL, February 23, 2017 – Digital Check Corp. has introduced a new version of its popular SmartSource Micro Elite check scanner that includes a built-in one-line Inkjet printer for endorsing the back of scanned documents. The functionality comes first to the Serial Embedded (SE) model of the Micro Elite, with a possible Inkjet option for the standard Micro Elite scanner to be determined at a later date. The new model helps fill a niche in the SmartSource product line for remote deposit customers who require an inexpensive single-feed scanner with endorsement capabilities. The Micro Elite SE combines the standard functionality of the Micro Elite with an onboard processor that runs the scanner using an embedded API. This allows the device to communicate with Windows, Mac OS X, and Linux systems, as well as workstations in virtual environments, such as Citrix and VMWare. Since the entire API resides on the scanner, support for the Micro Elite SE is simple to add to most banking software platforms, requiring only a few new commands instead of a major integration. Additionally, the SE version supports a “driverless install” and does not require a separate USB driver to be installed in order to function. The SE is also supported by Silver Bullet’s popular Ranger® API. Since its introduction, the Micro Elite has possessed the smallest form factor of any mainstream check scanner. The new Inkjet model maintains that tradition at only 7.3 inches long by 5 inches wide, having gained just one-half inch in width after the addition of the endorser. 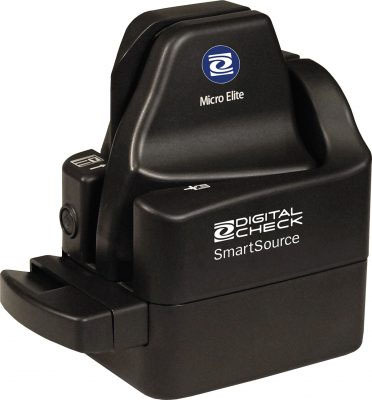 The SmartSource Micro Elite SE with Inkjet is available effective immediately. For more information about the Micro Elite SE, or about the SmartSource API, please contact your Digital Check account representative or call (847) 446-2285. Digital Check provides superior check scanners and document capture products for teller capture, branch automation, remote deposit capture, and remote lockbox applications. Digital Check’s award-winning CheXpress®, TellerScan®, BranchXpress®, and SB Series™ check and document scanners are among the most cost-effective and reliable in the industry. With the addition of the SmartSource® line of check scanners and peripherals, Digital Check is now the largest dedicated manufacturer of check scanning equipment in the world. The company also provides software solutions for image quality, vault processing, and remote monitoring and geolocation tracking of check scanners across an enterprise.